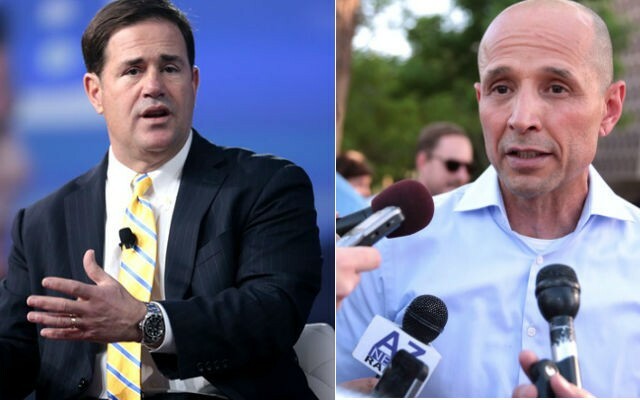 A new poll released Wednesday by Public Policy Polling shows Democratic candidate behind Republican incumbent Doug Ducey by just one point, according to 12News. In a survey conducted in August, 44 percent of Arizona voters chose Ducey, while 43 percent chose Garcia. Only 13 percent of Arizona voters were undecided between the two candidates, according to Public Policy Polling. The polling research included that 45 percent of voters surveyed disapprove of Ducey’s job as governor. It also pointed out that Garcia leads Ducey among Independents (46 percent to 36 percent), women (45 percent to 41 percent), and Latino voters (52 percent to 22 percent). Public Policy Polling interviewed 554 Arizona voters on August 30 and 31. The survey’s margin of error is +/-4.2 percent. The polling group says the research was conducted on behalf of Garcia’s campaign. Next articleCreationists have no place participating in developing Public School Science Standards. That’s an old poll. The news article is dated 9/5. How do we win that 1 percentage point? Everything Arizona is or isn’t, today, is the responsibility of the Republican one party dictatorship in this State. They can’t blame anything on anyone else, as they have been in power so long. Poor roads, terrible K-12 education funding, horrible community college support, profiteering, unaccountable charter school operators, exploitive, unaccountable private school money laundering, a tax system for the rich, voter surpression, contempt for the referendum process, and border security– all on them. Good list and well said. Don’t forget all the fun laws governing a woman’s body, and the zero laws governing a man’s.